Spoons, Toons & Booze ROCKS! SecretFormula Presents...Spoons Toons & Booze from SecretFormula on Vimeo. 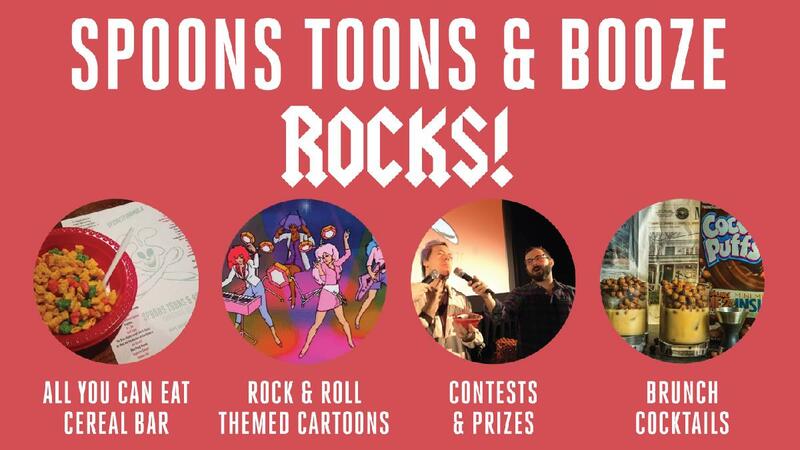 Live out your rock n’ roll fantasies at Spoons, Toons & Booze Rocks! We’ve got your favorite Saturday morning and weekday afternoon cartoons on the big screen plus a special menu of episodes featuring rock stars, band breakups, musical numbers, band parodies, battles of the bands, some bodacious shredding from an animated Bill & Ted and maybe something that’s truly, truly, truly outrageous. Hosted by SecretFormula's cartoon and cereal experts Michael Austin and Nell Casey. – Brunch cocktail menu including “The Sonny”, a White Russian topped with Cocoa Puffs!